Craft cider is an agricultural product made by fermenting the fresh-pressed juice of apples. Ciders range from sweet to dry, from still to bubbly and from simple to complex in flavor and aroma. The revival of hard cider in America has been led by growers and cider makers in New York bringing apple cultivars rich in acidity, tannins and fragrance back into our orchards. The result is an array of diverse and delicious ciders that reflect terroir, complement everyday and special celebrations and make food sing. New York State cider is perfect for sharing any time of year. Here are some ways to learn more and enjoy our state’s signature beverage! 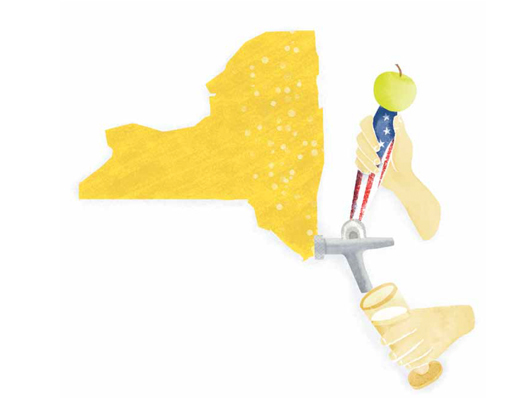 The Spirit of '76: Never mind the tea party — it’s time New York staged a hard-cider revolution.